Saturn eclipses the sun. This image is in the public domain because it was solely created by NASA. It was obtained from Wikipedia Commons. Here is a link for more Cassini images. Here is a link for excellent info on Saturn including a breakdown of the rings. and here is even closer, so you can see the moon. The craft is on the other side of Saturn...746 million miles from Earth. I understand that the exposure has been brightened but the colors are natural....those that would be seen by the human eye. The atmosphere of Saturn is lit up from behind, which is what makes it look like it was drawn with a protractor. The light around the outside shows the edge of the rings. The whole thing is more than 400 thousand miles across. The earth is barely perceptible in the lower right corner of the picture. Mars and Venus are in the upper left corner. (This picture as well as all the others throughout this blog can be viewed in "light box". It might help you see more of the detail.) The earth and her neighbors look so small...like something a photographer would blot away if she were trying to clean up the dust in a picture. I love these pictures but found them a bit beyond my ken. I went for a walk with Wilson and Molly on Mansion Beach while I tried to think about it. I worked on forming a concept or a feeling. I began constructing it in my mind: Me and Wilson and Molly on the beach...the beach on Block Island...Block Island on the earth...the earth in the solar system...the solar system in the galaxy…each new context nesting and dwarfing the one before. I blew it somewhere between Block Island and the earth...lost any connection to what that could possibly mean. It became like trying to understand how much bigger a number could get by throwing a thousand zeros on the end of it, and then a million more. Then we went to the end of Corn Neck Road to Sachem Pond. It had been grey all day and I didn’t expect any pictures but I went just to see what would happen. I wouldn’t even have had my camera with me if I didn’t have a policy about it. The policy is that I take my camera whenever I go unless it is raining so hard I would break it. This is because without fail…something great will happen (This is a law of nature.) simply because I don’t have it with me. It was bleak and dull and getting darker. There was some interesting light behind the clouds. I didn’t think it was anything special but I finally realized and began to take many pictures, two of which are shown below. I should have known better from the beginning. It’s the photographer’s job to know this… to find and demonstrate the objective wonder in the ordinary things that are easy to take for granted. It has been proven to me so many times, that there is nothing that is not worth seeing…that there is beauty in things that I’ve seen once or a thousand times, in things I consider special and things I consider insignificant, on days with good and bad light. I know the universe is beautiful but I learned something else again this evening, and I’ll probably forget and learn it again and again…how beautiful almost nothing can be. 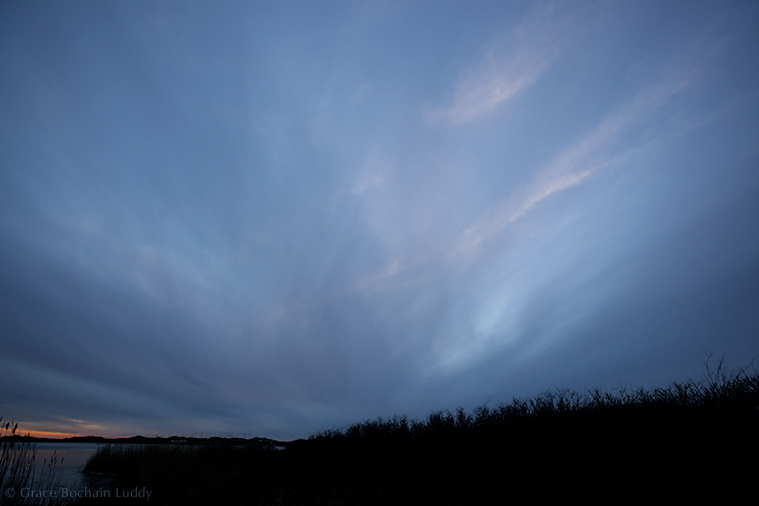 Looking northeast from Sachem Pond, across the grasses and a little patch of snow to Block Island Sound at dusk. In the opposite direction... looking northwest over Sachem Pond with a little bit of red from the sunset.